Giant hogweed (Heracleum mantegazzianum) has recently entered the news in Virginia after having been spotted for the first time in the Commonwealth. Also known as giant cow parsnip due to similarities to native cow parsnip, giant hogweed is classified as a noxious weed and can reach up to 10-15 feet in height. The difference from cow parsnip can be determined partially by its height but mostly by the purple splotches of color on the stalk and the extremely wide leaves which can reach over a meter in diameter and have a serrated appearance. While both can cause photodermatitis, giant hogweed causes much more severe burns than cow parsnip. Where is giant hogweed found? Giant hogweed originates from Central Asia and was brought to Britain in the 19th century and finally to the US as an ornamental plant. It was known to exist in states such as Washington, Oregon, Michigan, New York, and other Northern East Coast states. Until recently, no giant hogweed has ever been reported in Virginia. 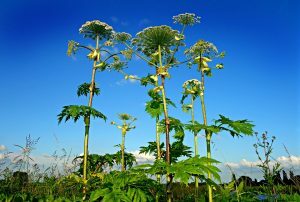 How can giant hogweed affect my health? Contact with the sap of giant hogweed can cause intensely painful skin lesions, with symptoms appearing 24-48 hours after contact. In rare cases, giant hogweed can cause significant necrotic damage with considerable depth of cellular death. The active compound in the sap of giant hogweed is a furanocoumarin and is found in every part of the plant but is most prevalent in the leaves. There are three furanocoumarin analogue compounds in giant hogweed: psoralen, bergapten, and methoxsalen. These compounds are to blame for the severity of hogweed burns and also are the primary difference between giant hogweed and other umbellifers containing furanocoumarins like cow parsnip. Cow parsnip only shares the chemical bergapten with giant hogweed which does contribute to the burns. However, psoralens are the most potent of the furanocoumarins and are found only in giant hogweed, most abundantly in the leaves. Is exposure to giant hogweed treatable? Medical treatment is largely supportive. A number of treatments have been described, including oral and topical steroids, intermittent ice application, limiting light exposure (natural or artificial), and various oral analgesics. Patients should be warned that lesions can persist for weeks with accompanying pain. Residual pain, systemic fatigue, and photosensitivity have been reported to linger for months. Post-inflammatory hyperpigmentation can persist indefinitely following exposure. If questions arise on this or any other poisoning, the medical staff at the Blue Ridge Poison Center would happy to assist. Free medical consult is available 24 hours a day, every day: 1-800-222-1222. The complete article on giant hogweed can be found here.